A delicious party dish to WOW your guests over the festive season! Preheat oven to 200°C or 180°C fan. Spray four 12-hole mini muffin pans lightly with oil. Spray 1 sheet of filo pastry lightly with cooking oil spray. Top with another sheet and fold in half across. Spray with oil and cut into 6.5cm rounds. Ease pastry rounds into a muffin pan. Repeat with remaining pastry to form 48 pastry cases. Bake for 5 minutes, until browned and crisp. Combine remaining ingredients, except dill sprigs, in a bowl. Season to taste and chill for 1 hour. 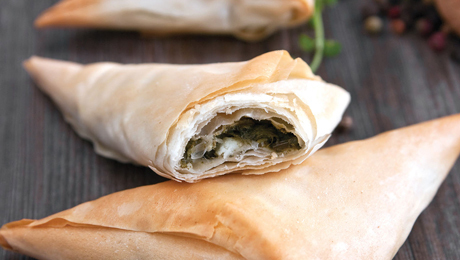 Spoon spinach mixture into filo cases. Top with dill to serve.